If you or your HR rep is any good, you will be doing a social media background check on me and you will have found my blog, EMScholar. I’d like you to consider the blog a portfolio of my growth as an Emergency Manager and humanitarian. While the blog is professional in nature, I did not try to hide my personal beliefs because I don’t believe you can separate the personal from the professional and neither do you. During an interview, for instance, you are looking for a gut reaction which tells you if you like the person or not, whether they’ll be a good fit or not–not whether they’re good at their job. So since I haven’t hidden my personal beliefs, you will notice that I have posted some religious-in-nature content. Perhaps this concerns you because you might work for a non-religious or even governmental entity and–if we were to be honest–the political strategies and comments of the “Religious Right” have made all religious people seem a little crazy. Or perhaps my religious content makes you nervous because you are religious too and you don’t know if I believe the same things you do. And–unfortunately–religious people are known for being passionately and aggressively against any idea which they oppose. Let me assure you that, while I am religious, I will not treat you or your ideas poorly. I cannot avoid the fact that I am motivated–in part–by my religious upbringing. Like Jesus, I care about people and I want to work to alleviate suffering. Unlike Jesus, I am not here to proselytize. I will not treat homosexuals, Arab immigrants, atheists, scientists, or even you with disrespect. I will not try to change your mind, make you feel guilty, or act ‘holier-than-thou’. Instead, I will love people and work to protect their freedom to believe what they want. I will be curious about you and your perspective. I will work with you and be an eager participant in teams. I will work hard, be professional, be cheerful, eat good food, and drink good drink. I will be responsible for my mistakes, apologize, and do better next time. I will be a good citizen, a good daughter, wife, sister, and mom, and a good employee. Unfortunately, I will also have integrity. I will act ethically. I will criticize poor quality programs, wasteful use of money, and corruption. I cannot be bribed. I will hold myself and you to be responsible to our constituents/clients, and I will be obnoxiously, stubbornly opposed to unethical activity. If that sounds good to you, then I think we should get into business together. 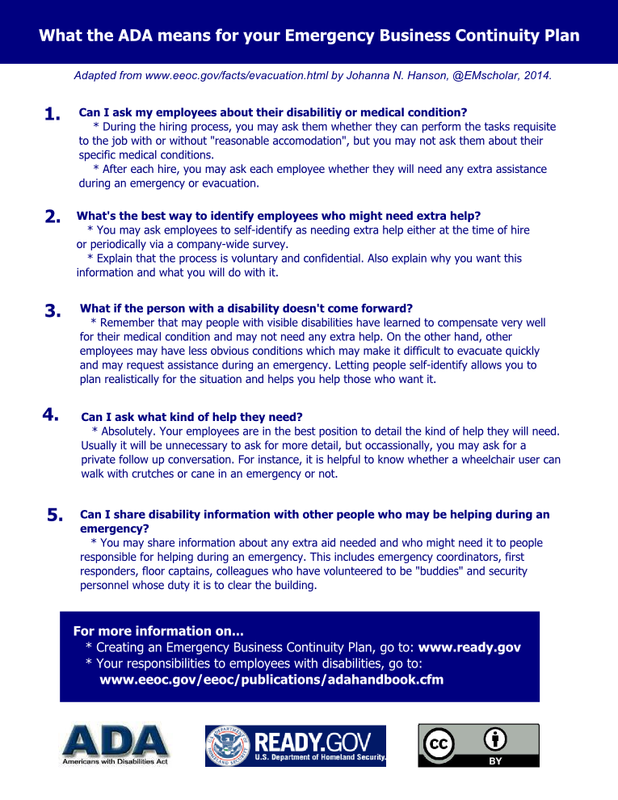 Business owners are asking whether or not they’re allowed to ask their disabled employees if they need help during an evacuation. The ADA released a FAQ sheet with their recommendations which I adapted into a more attractive format. It is licensed under a creative commons license which means you are allowed to print, distribute, reformat, adapt, and repost to your heart’s content as long as you give attribution. The information you need for proper attribution is at the top of the page underneath the title. Hope you find it helpful! 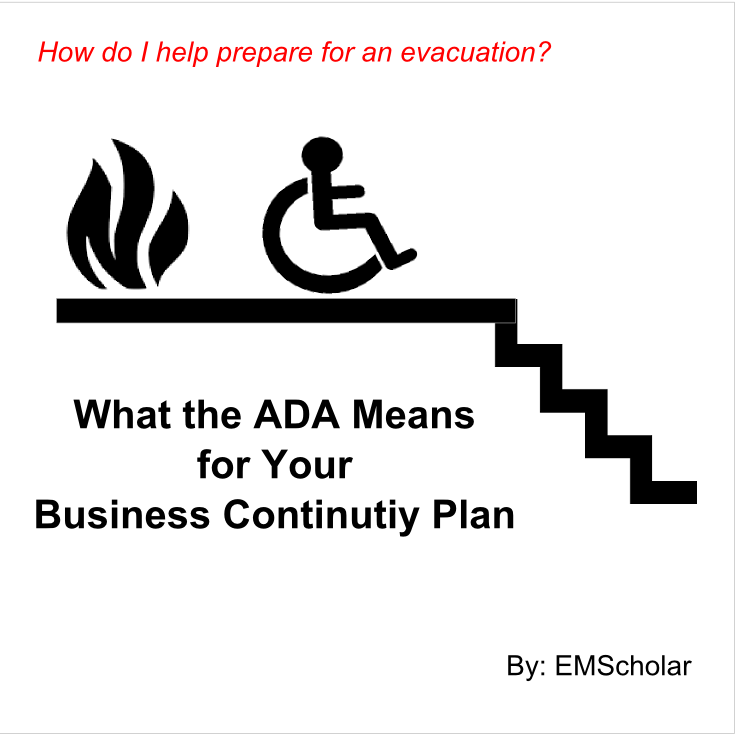 Do you have more questions about creating an Emergency Business Continuity plan or preparedness in general? Ask below!